Generators come in real handy during tough weather conditions like heavy storms, rains, and hurricanes. Such extreme situations can lead to power outages, leaving you in darkness. Your best bet in such times is a generator. However, there’s a bit of a problem with conventional generators. They mostly operate on gasoline which can be a bit difficult to obtain and is also a bit expensive. Fortunately, there’s a solution to this problem and it comes in the form of dual generators. Dual generators are a bit different than standard generators. They give you the option to choose between two fuel types: gasoline or propane. The first hybrid generator that makes it to our list is Champion 3800. This dual fuel generator offers 4750 starting and 3800 running watts. It has a large fuel tank and extended runtime, making it suitable for areas where power outages are common. ​RV suitable (contains a TT-30R outlet). ​Read voltage with an equipped voltmeter. Versatility is one of the strongest suits of this generator. This RV-suitable generator is perfect for homes and outdoors. There’s a TT-30R outlet which connects the generator with the RV without any trouble. The 3.4 gallon gas tank is large enough to keep it operational for 9 hours on gasoline (50% load) and 10.5 hours on propane (50% load). With such long backup hours, you will be able to sleep peacefully without having to worry about fuel or the generator dying out. Plus, it is safe to use all kinds of appliances as it contains a voltguard. The voltguard gives protection to sensitive appliances when voltage fluctuates. Hence, you can use the generator to run all kinds of appliances including mobile phones. Moreover, it also incorporates a gauge meter that tells you the amount of power used and output delivered. Two 120V 20A household outlets. The huge variety in outlets makes it a perfect choice for home and RV. 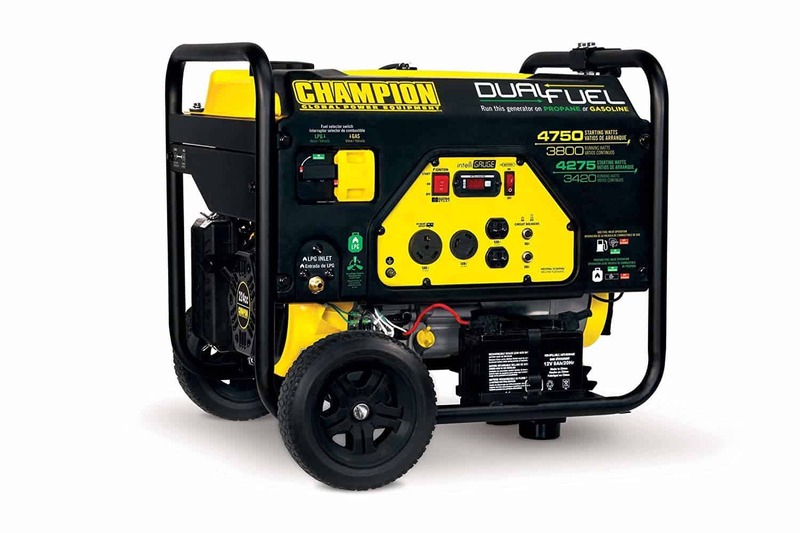 Champion 3800 is an easy to use generator and has an electric push button start system. You will not have to waste a lot of energy trying to get it to work. In addition to this, it is safe to use. It shuts down on its own when the oil gets too low. This feature protects the generator and the connected appliances as well. The unit is not quite silent though. It produces noise equal to 68 decibels, which is the same as someone constantly laughing near you. ​Supports both electrical and recoil start. Champion 3800-Watt Dual Fuel RV Ready Portable Generator can be a great pick if you are looking for the best dual fuel generator. It has wheels underneath for better transportation making it suitable for outdoor use. Pulsar is a popular brand when it comes to dual fuel generators. Pulsar 5,250W generator is no different and for many is the best dual fuel generators as it offers some kickass features. You can choose between two fuel types and enjoy great power. ​Switch and go technology (transition between fuel types while the unit is operational). ​Equipped with a digital meter and low oil shutdown indicator. ​Comes with a propane hose. This generator has a 4-stroke 244cc power engine that delivers 5250 peak watts and 4750 running watts on gasoline. In the case of propane, you will get 4250 peak watts and 3850 running watts. This is enough to run even some big appliances including air conditioners as they require only about 3500 watts to start. The Switch And Go Technology on this unit is a rare one. It gives you the power to change the fuel type from gas to propane or vise versa while the generator is running. This comes in real handy. You can easily switch between two fuel types to increase power or runtime, if one fuel is near the end. Very few generators offer this feature. Plus, it is easy to manage thanks to a simple switch system. The generator provides a runtime of 12 hours on 50% loud thanks to a big, 4-gallon tank. The runtime remains same for both fuel types. These four are enough to kickstart an RV and run home appliances. The generator is a breeze to operate thanks to the top mounted fuel gauge and an hour meter at the bottom that keeps you updated about the performance. Moreover, it’s an electric button start generator which is another great plus. On the flip side, it is a bit noisy with 78 dB of sound rating. We suggest that you invest in an extension cord and place the generator at a distance so that the noise can be less bothersome. ​It can easily power up a 240V well pump. ​The air filter prevents it from overheating. ​Contains a drop handle to enhance portability. Pulsar 5,250W Dual Fuel Portable Generator with Switch and Go Technology as all the qualities of a good dual fuel generator. It may be a bit noisy, but the positives seem to outweigh the negatives in this one as it is very powerful and the ability to change fuel while the generator is up and running is another great plus. Another beauty from Champion on the best dual fuel generators list as the company is known to make excellent products. It’s rare to find a dual fuel generator that asks for little maintenance and offers lots of power. Champion 7500 is good at preventing overloads and also protects appliances from getting fried thanks to the voltguard protection. ​Propane hose and oil (included). ​U-shaped handles and wheels enhance portability. This powerful dual fuel generator offers 9375 starting watts and 7500 running watts on gasoline and 8400 starting watts plus 6750 running watts on propane. A 120V 30A locking outlet. A 120/240V 30A locking outlet. Four 120V 20A household outlets. This is quite a bit of power, making it a suitable option to run big appliances, including field tools as it is suitable for all appliances that require 7500 or less running watts. Plus, the output is uniform, hence there is no risk of damage. It has a large fuel tank of 6.1 gallon that offers a runtime of up to 8 hours at 50% loud on gasoline and 5.5 hours on propane. You can enjoy extended runtimes by decreasing the overall load. One special function of this unit is its ability to start in cold weather thanks to the cold start feature. Apart from that, it also has an intelligauge. This component help maintain the generator by giving you information regarding power output, hertz, voltage, etc. You will get 1.2 quarts of 10W30 oil with the unit. Moreover, you will be notified when the oil gets low, courtesy of low oil shut down feature. This feature restricts the generator from further operation if oil is low. The generator is louder than a vacuum with 74 dB of noise rating. However, you can reduce it by placing it in the basement or garage as it supports extension cords. ​Comes with a 5.5 inch propane hose. ​Built in surge protector avoids overloading. ​Easily electric push button start. ​A bit heavier at 205 pounds and also noisy. Pick Champion 7500-Watt Dual Fuel Portable Generator with Electric Start is consistency is of importance to you. It offers safety features, incorporates a large tank, and is quite durable as well. If you are looking for a dual fuel generator that delivers clean and consistent energy can consider this beauty. With 9000 surge watts and 7250 rated watts, this powerful generator can run a multitude of appliances. ​A strong 420v OHV engine with a cast iron sleeve. ​Harmonic distortion is less than 5%. ​Contains a voltmeter for monitoring. Put your worries to rest as you will have no trouble in starting this generator thanks to the electric start option. Plus, it also has the recoil system as a backup. Its 6.6-gallon tank can deliver power for more than 9.5 hours. Plus, running a variety of appliances will be no issue as it offers 10 connectable outlets (120/240 V). It’s even safe for sensitive appliances thanks to a total harmonic distortion of less than 5% which means that it can handle voltage fluctuation and keep your electronic items safe. 75 dB of noise. The best way to reduce the noise is to keep the generator at least 30 feet away. However, do not let its weight of 215 pounds worry you. It comes with wheels, making it easily portable. ​Doesn’t come with a tank. If you desire a powerful, versatile, and safe to use generator then Powerhorse Dual Fuel Generator 9000 Surge Watts will not disappoint you. It is one of the best dual fuel generators for all the right reasons. This one is a heavy duty dual fuel generator made to run a large number of big and small appliances. However, that’s not its only benefit. It comes with several other features as well. ​Less vibration and noise thanks to the heavy duty frame. ​Circuit breaker protection and low oil indication. ​Fuel efficient and RV ready. Nicknamed the “beast”, it packs a powerful 457cc engine that o offer 12,000W of power. Furthermore, there’s a voltmeter to gauge voltage and circuit breaker to cut the power off in case of overloading. Durability is another strong feature you will find on this unit. It has a heavy duty frame with four point fully isolated motor mounts. The frame ensures the unit remains sturdy and there is little noise. On top of that, it has a noise muffler to further diminish noise. It offers a runtime of 10 hours on gasoline (50%) load. It doubles when run on propane. Plus, it is easy to start thanks to the electric start functionality. One twist lock 120/240V outlet. With 12,000W of power and multiple outlets, you can run many appliances simultaneously. Plus, low-oil shut off feature ensures generator or appliances sustain no damage. The unit is almost 270 pounds in weight but thanks to its solid wheels, portability is not a concern. In addition to that, you can also fold the handles down and store the generator away when not in use. ​20 hours of runtime on propane. ​Does not support parallel connection. DuroMax Hybrid Dual Fuel XP12000EH 12,000-Watt Portable Generator can be a good pick if you wish to run big appliances. It is among the best dual fuel generators. Why Choose Dual Fuel Generator Over Single Fuel? It’s always good to have options. Believe it or not, there are some regions where gasoline is more expensive or more easily available than propane and vice versa. Having a generator that lets you choose between two options puts you in a great place as you can pick one that you can easily get your hands on, especially in tough situations where access to fuel is limited. Propane is cheaper and easily available while gasoline can be a bit expensive and hard to find. Apart from that, propane is safer for the environment as it emits less harmful gases when compared to gasoline. Other than this, consider your regional temperature as well when choosing a fuel. Gasoline might be a cheaper option but it is consumed very quickly. This is because heat makes it evaporate faster. Hence, it may not be suitable for very hot regions. Similarly, living in a colder region can be a bit problematic for people who are thinking of using propane. This fuel begins to contract below 40 degrees. Hence, it may not be suitable for very cold regions. Now, the question is how to choose a dual fuel generator that offers plenty of features and is suited as per your needs. There are a number of products on the market, hence picking one can be quite a challenge. Regional Temperature: Believe it or not, your regional temperature can make a lot of difference when selecting a generator. First of all, some generators do not start well in winters as the engine may get frozen. This is why for very cold areas, you should go for a generator like Champion 7500-Watt Dual Fuel Portable Generator with Electric Start. Its cold start feature ensures you have no problem in turning it on even when it’s snowy outside. Power: This is a no brainer. Generators offer limited power, hence you must know exactly how much power you need so that you can pick the right generator. As a rule of thumb, appliances that involve heating or cooling (ACs, refrigerators) require a lot of power. If you want to run such appliances, you will need to go for a unit that provides at least 5000W of power, such as Pulsar 5,250W Dual Fuel Portable Generator with Switch and Go Technology. It’s a powerful generator that is made to run almost all home appliances. Types Of Appliances You Want To Run: This is important to ensure all appliances can run without any trouble. You have to pay attention to two features: outlets and the sensitivity of appliances. Some appliances, such as laptops, are sensitive and require continuous power as fluctuations can be bad for them. We suggest you go for Powerhorse Dual Fuel Generator 9000 Surge Watts if you want to run a variety of appliances including sensitive appliances. It produces a total harmonic distortion of less than 5% and offers 10 connectable outlets, making it suitable for a variety of uses. Plus, you can even use it outdoors and to run RVs. Safety: Some of the most common safety features you need to look into are: low oil indicator, voltguard protection, voltmeter, and overheating protection. These features are not only important for the safety of generators and other appliances, but also for the safety of your family members. They ensure the generator shuts down automatically if anything goes wrong, so be sure to look for these features when picking a dual fuel generator. Champion 3800-Watt Dual Fuel RV Ready Portable Generator can be a good choice as it’s safe to use and is also environmentally friendly. Noise: Pay special attention to this factor as noisy generators can be a pain to handle. While big generators tend to be noisy, some now come with mufflers and other features to suppress the noise so pay special attention to such features. Anything under 40 dB is said to be acceptable as it only equals to slight whispering but generator above 50 dB can be very noisy. ​A bunch of people having a conversation at a distance. ​Price: Heavy duty generators will obviously cost more than low-powered dual fuel generators. If you wish to run a few appliances then you won’t need to spend a lot of money and can get a small to medium ranged dual fuel generator. However, if you wish to run heavier appliances and lots of them then you will need a heavy duty generator like DuroMax Hybrid Dual Fuel XP12000EH 12,000-Watt Portable Generator. It is quite powerful and offers excellent run-time as well. Q. Is it wise to charge sensitive electronics using a dual fuel generator? Ans. Sensitive electronics aren’t able to withstand voltage fluctuations and may easily sustain damage. To avoid your delicate electronics from burning up, make sure to choose a generator that offers clean energy. Some generators use sine wave technology and have features to prevent fluctuations. Q. How can I lower the noise of a loud generator? Ans. While it won’t make a lot of difference but keeping them elevated can help. This is because generators vibrate on the ground and produce more sound. Keeping them above the ground will minimize noise. Apart from that, buy an extension cord and place them at a considerable distance for additional safety. Q. Can I use dual fuel generators outdoors? Ans. Yes, depending on the make and model. Many dual fuel generators are perfect for outdoor use. These were some of the best dual fuel generators that you can opt for. Make sure to identify your needs first and then choose the right one. A conventional generator might not be the best choice to run delicate appliances. You need an inverter generator as it produces clean energy thanks to the presence of an alternator. Inverter generators convert AC electricity into DC electricity that’s safer and more reliable. Thanks to this clean energy output, an inverter generator can be used to power sensitive devices including medical appliances, mobile phones, and laptops. There are many benefits of an inverter generator. It helps you save fuel, minimizes emissions, and also reduces noise. Thanks to these traits and the ability to convert AC into DC, this generator is a viable fit for both heavy and sensitive appliances. Such generators are perfect for indoors and outdoors, hence you even carry one when you go out on camping or hunting trips. There are many inverter generators on the market to choose from, however picking one can be quite difficult due to the huge variety of available options. Let’s have a look at detailed reviews of our top inverter generators. They are also called intelligent generators due to their ability to adjust engine speed as per the load. Yamaha EF2000iSv2 is a gas powered smart inverter generator that caters to both indoor and outdoor needs. It is quiet in operation and thanks to the inverter technology, adjusts the engine speed according to the power requirements. ​Inverter system with PWM control. ​Enclosed in a noise absorbing material. ​Twin Tech option to double the output. There are many amazing features in this inverter generator such as noise suppression frame, overloading protection, adequate fuel tank, etc. If you’re looking for a quiet inverter generator then this one fits the bill. It produces only 51 dB of noise when operated at 25% load. The maximum noise it produces is only 61 dB at 100% load. In addition to that, it has isolated rubber feet to suppress vibrations. Thanks to these amazing features, you can use this generator anywhere. It’s a powerful unit capable of delivering 2000W of peak power and 1600W of running power. While this is enough power to run smaller appliances, it may not be enough for some users. If such is the case, you can use Twin Tech functionality to connect two generators to double the power. Also known as parallel capability, this feature is great when you want to run more appliances or enjoy longer run-times. There’s a large 1.1-gallon fuel tank that offers a runtime of almost 10.5 hours when you keep the load at 25%. This is good enough as you can enjoy a good night’s sleep without having to worry about running out of fuel. Plus, it’s also fuel efficient. The engine can adjust the speed automatically and there’s a dual coil alternator stator that reduces fuel consumption. It also supports 8A 12V outlets to charge batteries. You will, however, have to buy it separately. Additionally, the generator is safe to use. It keeps all the components and circuits safe thanks to overpower protection that breaks the circuit if the load increases the generator’s ability. It’s important to prevent the generator from damaging connected devices. You can use this generator for home or outdoor since it is super light and easier to travel with. ​Fuel gauge notifies you when fuel is low. ​Auto decompression helps start the unit during winter. ​USFS-approved spark arrestor reduces noise. ​Not very good at powering heavier appliances. Yamaha EF2000iSv2 is the best inverter generator for people who wish to kickstart small to medium appliances. It is eas7 to travel with and has some kickass features. Honda EU2200i is an excellent inverter generator for small homes. It has a compact design and is hence easy to travel with. This unit delivers 2200 watt of clean energy and is the right fit for sensitive electronics. It consists of two important outlets that are commonly required in every household, the 30A locking plug and the 20A 125V outlet. ​Produces only 51 decibels of sound. ​Fuel efficient (up to 8.1 hours of run-time). Honda EU2200i comes with a powerful GX120 121cc engine. This engine is superior in many aspects, especially in handling heavy loads. There will be no fluctuations. This is why EU2200i is a good choice to run delicate appliances. This inverter generator is super quiet when operational. It produces noise between 47 to 57 dB depending upon the load is. At 25% load, it will make only 51 dB of noise which means you will feel at ease even when the generator is up and running. The inverter technology that runs this unit not only makes sure that clean energy is produced but it also prevents the unit from tripping. Sometimes, when the power exceeds the running watts, some generators trip. But this doesn’t happen with EU2200i thanks to amazing features that ensure the generator and all running appliances remain running and safe. It delivers non-stop 1800 watts of running power and 2200 watts of starting power. You can also increase the output by connecting another similar generator in parallel to double the output power. The parallel connection will allow you to use 4400w of power. This will allow you to run more appliances and for longer hours. The runtime offered by the unit is between 4 to 9 hours depending on the load. On full load, it will run for 4 hours. For extended runtime, lower the load to 25% to make it run for up to 9 hours. It contains a 0.95-gallon fuel tank which can last for a good period of time. Moreover, you can increase the capacity by attaching an external fuel tank as well. Safety is another strong feature of this inverter generator. It supports electric circuit breaker technology and also alerts when the oil is low. ​Large drain hole to expel oil easily. ​A plastic covering on the unit protects it from outside elements such as rain. ​Only 40 pounds in weight (easy to move). ​No electric button start option. Honda EU2200i 2200-Watt 120-Volt is super quiet, portable, safe to use, and powerful. You can use it to power up appliances at home or use it for outdoor purposes as well making it the best inverter generator. Champion 4000 is a premium inverter generator that produces 4000w of starting power and 3500w of running power. This much power is enough to run most of the appliances such as washing machines, refrigerators, etc. That’s not all, thanks to the inverter technology, you can also run sensitive appliances with peace of mind. ​30 amp RV outlet/12V DC outlet. ​Less than 3% harmonic distortion. ​Longer runtime of 17 hours. It is an intelligent generator for a number of reasons. It has an LED system that shows the generator’s status with a few other details that can help you maintain the generator. It will alert you when the oil is low and also notify you when the power overloads. A large 2.9-gallon fuel tank ensures the generator runs for about 17 long hours on a full tank. In case, you want it to run even longer, you can switch the running mode to eco mode and extend the runtime. Another smart feature found in this generator is its ability to auto adjust fuel consumption as per the load. One 120V 30A RV outlet. One dual USB adapter with a 12V DC outlet. Thanks to the availability of these outlets, you can use it for home, RVs, and campings as well as you’d be able to run a good number of appliances with this beauty. The unit produces 64 dB of noise which is acceptable as long as you keep it 23 feet away. You can operate many appliances at once by connecting them to various outlets as it delivers 3500 watts of continuous power. There are no fluctuations and the best part is that you can double the power to 7000w by connecting another similar model by using the parallel connection feature. Hence, powering heavier appliances such as AC units won’t be a problem anymore. It’s quite a durable generator thanks to its ability to detect low oil and shut down. This is important as it protects not just the generator but also the connected appliances. ​3-year warranty and lifetime technical aid from the company. ​Adding and draining oil is easy. ​Eco mode consumes less fuel. ​Louder when not running on eco mode. Champion 4000-Watt RV Ready DH Series Open Frame Inverter with Quiet Technology is the right choice for people with medium to big homes. It can kickstart many appliances and produces clean energy making it the best inverter generator. People looking for powerful inverter generators should definitely consider this one. It delivers 6500W of raw power and is capable of running almost any home appliance. Quiet operation is one of the strongest traits of this unit and it also offers excellent runtimes. ​Extended runtime of 14 hours. ​60% quieter than standard generators. ​Contains 7 outlets for powering multiple appliances. When you want to run heavy and power-hungry appliances such as irons, LCDs washing machines, dryers, a normal inverter generator won’t help. You need a juggernaut of an inverter generator such as the Briggs & Stratton Q6500. It produces 6500 watts of clean energy to kickstart a plethora of appliances. You can connect up to seven appliances at once as there are 7 outlets provided by this unit including two USB outlets, four 20V-20A GFCI-protected outlets and one 120V-240V-30A locking outlet. The abundance of outlets makes it perfect for TVs, camping trips, and indoor uses. Plus, it is also very safe to use as it offers consistent power. There are no fluctuations, making it safe to run all kinds of appliances. The problem with heavy generators is that they produce a lot of noise but not this one. It produces only 66 dB of sound at 25% load. Apart from that, it has a noise suppressing frame that keeps the noise down and also protects internal components from. Also, do not let the power fool you. The generator may be slightly heavy at 138 pounds but is quite mobile thanks to a comfortable telescopic handle for movement. Plus, it has 8” wheels that make the job easier. This generator offers an extended runtime of 14 hours when used on a full tank. This saves you from repeated refills and allows you to sleep and do your work without having any worries. Moreover, it also has a fuel gauge that lets you keep an eye out on the fuel and know when to add fuel to keep it running. ​The twist lock outlet offers 2500W of consistent power. ​Releases carbon monoxide (keep at least 20 feet away). Briggs & Stratton 30675 Q6500 Inverter Generator is considered the best inverter generator. It produces little noise and is also easier to move around. This unit is all about power. It can run a variety of appliances including ACs, dryers, refrigerators, TVs and more. It might be a heavier generator but it is a breeze to maintain and use thanks to some great features that are not found on most other generators. ​Meets NEC and ETL standards. ​Works on smart fuel injection technology. The Honda EU7000IS inverter generator will run for 18 consistent hours at 25% load. The runtime falls down to 6 hours at rated load but that’s also quite impressive considering how powerful it is. The unit incorporates a simple electric start mechanism that makes it easy to start it. It offers 7000 watts of power and produces only 52 dB of sound at 25% load. The noise increases to 60 decibels at full load but it’s also not very loud. This is possible due to the use of USDA-qualified spark muffler that greatly suppresses the noise. It’s safe to use thanks to the electronic circuit breaker feature that breaks the circuit if it gets overloaded. This feature is important for the safety of not just the generator but also connected appliances. One rare feature on this unit is the i-Monitor LCD. It displays a number of important stats such as the quantity of oil left, overload status, engine speed, number of operating hours, etc. Thanks to the i-Monitor LCD, you can keep tabs on various things. It makes handling easier and also add to the durability. Plus, due to the inverter technology, this generator produces super clean energy with less than 2.5% THD. Hence, it’s good to run all kinds of appliances. ​Fuel gauge makes it easy to maintain fuel. ​Easy folding handles for better handling. ​Extremely durable (enclosed in a heavy duty frame). ​Works on both recoil and electric start system. ​Very heavy at 260 pounds. Honda 7000W Inverter 120/240v Fuel Efficient Generator is a viable pick for users who want extra wattage to run heavier appliances. It is a beast at handling power and doesn’t cause fluctuation at all, hence it is known as the best inverter generator. Inverter generators are great as they are safe to use and offer some other benefits as well. However, they all claim to be the best inverter generators, hence you need to be careful when picking one. This is an important section. Go through all the headings to know what factors matter when you set out to buy an inverter generator. ​Choosing The Right Power Inverter: You can get smaller generators that only product about 2000W of power or you can opt for bigger generators that can go as high as 10000W.The only thing you need to consider is the number of appliances you have to run and the power they need to operate.1000W inverter generators are good if you only want to run a fan, bulb, and small appliances. It can also charge laptops or phones but may not be able to run bigger appliances.For those, you will need a unit that can produce at least 2500W of power. Such units can run television sets too. However, for bigger appliances like air conditioners, you will need a generator that can produce about 3000W of continuous power. ​Noise: It’s important to choose a generator with as little noise as possible. This is because loud generators can ruin the surroundings and also make it difficult to work or rest.You need to look at the decibel rating to understand how much noise a generator would make. Higher the decibel rating, louder a generator would be.If you are looking for extremely silent generators, go for ones that come under 50-70 decibels. It’s even better if the unit comes enclosed in a noise reducing frame and mufflers.Generators under 50 dB produce little to no noise. Anything above that can be troublesome. Remember that it will be hard to find a generator that’s completely silent. You can, however, take steps to reduce the noise.Never make the mistake of placing the generator on the ground as it can cause vibrations. Other than this, consider placing it at a distance so that the noise can be reduced.A distance of about 20 feet is said to be good as it does not only suppress the noise but also reduces the risk of health hazards. ​Starting Technology: Go for a generator that is easy to start. The electric start system is the best as you will only need to press a button to get the general started.Some generators, however, only offer a manual start. They require pulling the cord to start the generator. This mechanism can be irritating and also lead to backache. ​Safety FeaturesIf you’re a beginner, pick a generator that comes equipped with meter gauges so that you can keep tabs on the status. Moreover, look for features such as low oil shutdown so that you can prevent the unit from shutting off due to low oil.It can be very risky to operate a generator when the oil is low. Hence, such features can come in handy. #1 How can I know if it is an inverter generator? Ans. Most inverter generators will contain the letter “I” in the name. This I stands for ‘inverter’ and can help you identify an inverter generator. However, a more reliable technique is to look at the features. Honda EU2200i 2200-Watt 120-Volt Super Quiet Portable Inverter Generator, for example, contains the letter “i” in the name “EU2200i”. Since inverter generators are in demand, most sellers clearly mention it on the marketing material. #2 What are the benefits of inverter generators? Ans. The biggest benefit of inverter generators is the ability to charge sensitive appliances. These generators produce clean output, hence there is no risk of fluctuations and damage. #3 Which inverter generator should I buy? Ans. The right generator depends on your needs and requirements. .Yamaha EF2000iSv2, 1600 Running Watts/2000 Starting Watts, Gas Powered Portable Inverter, for example, can be a good pick if you want to run only a few appliances. Consider Honda 7000W Super Quiet Light Weight Inverter 120/240v Fuel Efficient Generator with iMonitor LCD if you want to run a high number of appliances or need a lot of power. #4 How often should I change the oil? Ans. While this changes from generator to generator and the manual is the best option to get the answer, you should ideally change oil every 100 hours of use. Only use the recommended oil and follow all the guidelines perfectly. Champion 4000-Watt RV Ready DH Series Open Frame Inverter with Quiet Technology comes with a detailed manual that answers all oil change related questions you may have. #5 What are the risk factors associated with using an inverter generator? Ans. Inverter generators like Briggs & Stratton 30675 Q6500 Inverter Generator are safe to use but you need to be careful about a few things. These generators, like most other generators, may produce harmful gases so make sure to keep distance. Also, follow all maintenance tips and get the generator serviced if you encounter problems. These are some of the best inverter generators you can go for. Pick one that suits you the best. With an RV ready and camping generator, you can make your outdoor expeditions worthwhile. The best camping and RV generator is one that is portable and has enough to connect your appliances. However, since the market is full of RV and camping generators, it can be difficult to pick the best RV and camping generator. To make it easier for you, we have chosen some of the best camping and RV generators on the basis of quality, features, portability, noise, and, of course, price. What Does It Mean to be RV Ready? There is no definition as such, but in simple words, RV ready generators are units that can be connected to the RV without needing any additional equipment. They have RV outlets to provide 30 amps of power for the RV. In addition to this, they may also have twist-lock generator adapters. Other than this, RV ready generators are also said to be quiet. Noise level is of huge importance since they have to be kept closer to the RV or camping side and a noisy generator can make it difficult to concentrate or rest. iGen 1200 is an ideal choice for people who want a smaller generator. It provides consistent and clean energy and packs quite a punch when it comes to running small outdoor appliances. Besides powering up an RV, it is also suitable for tailgating, camping. ​Fuel efficient mode to save fuel. ​20A circuit breaker to prevent damage from overloading. This small yet useful generator can offer 1200 starting watts and 1000 running watts. This much power is enough to go camping or connect to a small RV. Despite having a small 0.8 gallon fuel tank, it offers an extended runtime of 9 hours at 50% load. You can further extend the runtime to 12 hours by reducing the load to 25%. However, 1200 watts of power might not be enough to run some important appliances in your RV. This can be solved by connecting another similar generator using the parallel connection. It will double the power and make it reach 2400 watts. Outdoor generators should be lightweight and silent. So that people can transport them easily and enjoy their time without having to worry about the noise. Fortunately, this generator comes enclosed in an acoustic double insulated body that makes it super silent. On top of that, it also has silent mufflers to suppress the noise. Thanks to such features, the generator produces only 52 dB of noise at 25% load. Plus, you do not have to worry about fuel economy either as it consumes 50% less fuel than rival generators. This is possible due to the fuel efficiency mode that auto-adjusts the power as per the requirements. Thus, no fuel is wasted. Moreover, it is safe to run sensitive appliances without worries as it operates on pure sine wave technology that produces clean energy. You can charge your laptops or mobile devices without worried. The 4-stroke 54cc engine is powerful and causes no fluctuations. ​CARB, USFS, CARB, and EPA compliant. ​3 year warranty and lifetime technical support. ​Two USB ports (5V DC and 120VAC 20A duplex outlet). ​Parallel cord needs to be bought separately. Westinghouse iGen1200 Super Quiet Portable Inverter Generator can be a good choice if you only have small appliances to run. This luggage-styled portable generator is perfect for campings and RVs as it packs enough power. It offers 3000 of starting watts and 2600 of running watts. This is powerful enough to even run a small AC. ​Engine speed changes as per the load (Powerstart mode). ​Easier to move with the telescopic handle and wide wheels. ​Gauge generator load on Statstation LCD. It comes with four standard outlets and allows to connect four different appliances at the same time. It incorporates a 12v-30 amp locking outlet with RV adapter, USB port, and a DC outlet. Thus, you can easily connect it to an RV. With a large fuel tank of 1.5-gallon, it provides a runtime of about 10 hours at 25% load on a full tank. This generator has a unique Quiet Power mode that suppresses noise. Thanks to this feature, the unit produces only 58 dB of noise at 25% load. The noise may, however, get very loud at full capacity. There’s a simple control panel on the unit to display modes and keep tabs on overload status, power, and generator status. Moreover, it also has a reset button to safeguard the engine in case it gets overload. This generator is easy to maintain as it shows most of the settings on the control panel. You can figure out how much power and fuel it consumes. Moreover, it also features a low oil shutdown feature to prevent any sort of damage. While the generator is quite powerful, you can double the power by using the option to connect another generator to it. ​Suitable for home use, RV, and camping. ​Offers clean energy which is ideal for delicate electronics. ​6 inch wheels make it easier to move (tailgating and camping become easy). Briggs & Stratton 30545 P3000 PowerSmart Series Portable is perfect for RV use and camping as it will easily power up many appliances. To start heavier appliances, you can use the parallel connection as well. Another beauty from Champion as it is one of the best companies out there. Champion 4000 is a combination of power, convenience, and quiet operation. These three traits make it a suitable outdoor camping and RV generator. It delivers 4000 starting watts and 3500 running watts with which you can power up heavy duty appliances such as ACs, refrigerators, etc. This unit has a 2.9 gallon fuel tank which offers a runtime of about 17 hours when the tank is full. In fact, you can further extend the runtime by using it on the “Eco Mode”. In this mode, the unit uses less fuel by adjusting settings as per the load. It’s a great feature that increases run-time and saves fuel. It is an LED system that tells you about overloads, low oil, volts, and generator status. This is why it is known as a smart generator. Plus, these features also make it easier to maintain the generator. It has a 120V 30A RV outlet, two 120V 20A household outlet, and a dual USB adapter with a 12V DC outlet. These ports make it RV-ready and perfect for outdoors. Apart from that, it only produces 64 dB of noise which can be further reduced by placing it at a distance. If you feel that the unit doesn’t offer adequate power then consider connecting it with another unit using the parallel connection feature. It will boost the power wattage to 7000 watts and make it ready to power up refrigerators, ACs, and other heavier appliances. It also features a low oil shutdown option to save the unit from getting damaged. Moreover, the connected appliances are also safe as the unit produces clean energy. ​3-year warranty and lifetime technical assistance. ​Saves fuel with the economy mode. ​Wheels can be installed to improve portability. ​Louder when not operational on Eco Mode. Champion 4000-Watt RV Ready DH Series Open Frame Inverter with Quiet Technology is a viable option if you wish to power up RV and camping appliances. Pulsar 5250 is not only an RV ready and camping generator but offers plenty of useful features as well. First of all, it is a dual fuel capable unit that accepts both gasoline or propane. This makes your outdoor expeditions much easier as you can take along the most suited fuel on your trip. ​Switch between fuel types using the Switch And Go technology. ​Low oil shutdown indication and digital meter to show status. ​Propane hose is included (hooks to the RV directly). ​12 hours of runtime at half load. With a 4-stroke 244cc engine, this unit is capable of delivering 5250 peak watts and 4750 running watts on gasoline. When using propane, it will offer 4250 peak watts and 3850 running watts. Dual fuel technology is great as it puts you in a good position. You can increase runtime as you have a backup fuel system to fall back on. This makes the generator perfect for longer trips. Plus, one fuel is more affordable and readily available than others, hence you can easily pick one that you prefer. Moreover, the Switch And Go technology also makes it possible to change fuel type while the unit is still operational. This ensures you do not have to live without power even for a second. A large 4 gallon tank ensures it runs for up to 12 hours at half load. You can extend the runtime by a few more hours by reducing the load. There are 4 various outlets on the unit: two AC outlets, one RV port, and one twist lock outlet. Maintaining the unit is a breeze because it keeps you notified about performance. There’s a mounted fuel gauge for use. Plus, an hour meter that tell you how much fuel it is consuming and how much longer it will operate. These features help you maintain the generator and ensure it stays durable. Starting the unit is not a problem because it incorporates a simple electric push button start option. While it all looks good, there’s a slight problem with this unit though. It produces a sound of 78 dB which is a bit loud and might make your outdoor events a bit irritating. To overcome this problem, buy an extension cord and place the unit at a good distance so that you do not have to deal with a lot of noise. ​Contains a drop handle for easier transportation. ​Packs enough power to kickstart a 240V well pump. ​Loud at 78 dB of noise. Pulsar 5,250W Dual Fuel Portable Generator with Switch and Go Technology is powerful and offers the feasibility of choosing the best fuel source as well. You can power up multiple appliances with it and make your outdoor stays worthwhile. This is a long lasting, strong, and lightweight generator that delivers 6875 starting watts and 5500 running watts. It is enough to power a variety of appliances without any worries. Moreover, you can also charge delicate electronics with this generator as it produces clean energy and control voltage fluctuation. There’s no risk of causing damage to your gadgets. ​Large 7.2 gallon fuel tank. ​10 hours of runtime at 50% load. This reliable generator has a 7.2 gallon fuel tank that offers an excellent runtime of 10 hours at half the load. In case the loads get overwhelming, this unit will trip automatically to save it from malfunctioning thanks to the circuit breaking feature. This is a good feature as it also secures other appliances. With a 389cc OHV engine, this generator will provide with consistent and clean 5500 of running watts. It will help you connect an RV or run plenty of outdoor appliances as well. You can track maintenance intervals thanks to the pre-equipped hour meter. Furthermore, it also indicates if the oil is low to ensure you can refill it on time. The unit has four 5-20R 120V outlets and one L14-30R Twist-Lock 120/240V outlet to connect to an RV. These five outlets will let you operate 5 appliances at the same time. It is super easy to use and start thanks to the electric start system. Plus, there are large wheels underneath to make transportation easy. Moreover, it has a foldable handle that makes it easy to move and store the unit. ​Controls overload (circuit breaker technology). ​1-year labor and 2-year parts warranty (limited). Generac 5939 GP5500 5500 Running Watts/6875 Starting Watts Gas Powered Portable Generator is quite a powerful generator but can be a bit noisy at times. Pick this one if you’re interested in running big appliances. Since there are so many generators out there, you need to be smart and look into certain factors to ensure you get the best camping and RV generator. ​Gasoline: It is one of the cheapest options out there. Plus, it’s also readily available. Moreover, it is also easy to add or remove gasoline, hence such generators are typically easier to operate and manage. ​Propane: Propane gas generators are more efficient and produce less emission. Apart from that, propane has a longer shelf life than other fuel sources. Diesel: If you are looking to buy a fuel efficient generator for your RV then look for generators that operate on diesel fuel. However, such generators may not be environmentally friendly. Solar Powered: Save money on fuel and use solar powered generators to produce electricity. They use solar panels and can be RV-ready as well. They may be more expensive than other generator types but can be good in the long-run as they are eco-friendly and do not always require fuel. It is best to opt for dual fuel generators so you can choose between two common types. The most common fuel types are propane and gasoline. They are affordable and easily available so choose wisely. Clean Energy: You would need to charge a variety of appliances including sensitive appliances like laptops and mobile phones. This is why you’ll need clean energy. Using a powerful generator that has no control over voltage fluctuation can damage these appliances for good. Generators with pure sine wave technology can handle fluctuations and keep connected appliances safe. Noise: One of the most crucial factors is the amount of noise a generator produces. Your outdoor trips and journeys can be ruined if you pick a generator that is too loud. Imagine sitting with your friends and having to bear a loud noise that just wouldn’t stop. A noisy generator can even make it difficult to fall asleep. The most suitable generators for camping and RVs are the ones that produce under 60 dB of noise. Anything above that can be a bit irritating if the unit is placed close to you. Power: This one is a no brainer. You will need to calculate the amount of power you’ll need to operate certain appliances in your RV or camp. The right way to do this is to read the labels or just Google the amount of power required to run appliances. For small scale RVs and camps, a smaller generator that produces under 2000W can be enough. It will easily start a few smaller appliances. However, if you wish to run heavier appliances such as TV sets, ACs, and microwaves then you will need to pick a generator with at least 3000 watts. Portability: When you’re choosing an RV-ready generator, weight plays a vital role. You will be carrying the generator from place to place and a heavier generator can cause problems. Pick a generator that falls under 100 pounds so that you can carry it around easily. Tires and handles can also make a difference. Easy Maintenance: RV and camping generators are kept outdoors most of the time and hence require a lot of care. Voltmeter: A voltmeter attached to the generator shows the number of volts utilized by the unit. It helps you figure out how many volts each appliance uses so that you can control power and only run appliances that you need. Hour Meter: This gadget notifies of hourly updates and gives you information on run-time, oil, etc. Low Oil Shutdown: Some generators have a built-in feature that ensures the generator stays durable and reliable even when the oil is low. It automatically shuts down the generator in case of low oil to prevent failure. How To Keep A Generator In Good Shape When Travelling And Storing? Generators meant for RV and camping often lose efficiency if they are not maintained properly. Most RV ready generators are durable and very strong as they are made to deal with the harsh weather conditions and other such issues, yet you need to be careful when it comes to maintenance. 1. Servicing: Servicing is important to ensure all parts and components continue to work. You can service a generator by yourself if you have the experience, however, it is recommended to hire a professional for the job. Take it to a repair shop instead and have an expert look at it. They will perform a thorough checkup and correct fuel leaks and minor issues to improve efficiency. Some generators come with a warranty and free service, so avail such offers if you can. 2. Storing The Generator: When not in use, store the generator in a dry and cool place so that there are no fire or overheating hazards. Apart from that, make sure that there’s a shade above the unit so that rainwater doesn’t run into the generator. Moreover, keep it safe from moisture as well. This may not be much of a problem if you have a weatherproof generator but being careful is still important. 3. Use Fresh Fuel: Using old fuel can cause starting problems and higher emission. Use new fuel to keep it in good shape and run for a longer period of time. 4. Lubricate: Keep the generator lubricated to ensure there’s no rust and all parts work well. Also known as generator exercising, it involves lubricating the lines, valves, and components so that they work efficiently. 5. Oil Content: If the generator doesn’t have the low oil shutdown feature then use a dipstick to measure the oil contents and make sure it is filled enough. 6. Clean It Up: Always clean the generator up using a clean cloth, especially after you come back from a trip. Leave no traces of dust, grease, or oil on the unit. Moreover, clean the batteries, too. You can follow the manual for tips on how to get it done. How To Properly Connect A Generator To An RV? Location: Most of the RVs come with a generator tray that is above the ground to provide good stability. However, if your RV lacks a tray then make sure to build one. It is not wise to keep the unit on the ground as doing so may lead to more noise and performance issues. Plus, it can also afford the unit’s life. Fill The Tank: Some generators can be connected to the RV’s fuel supply using a propane hose. If yours doesn’t then manually fill the tank up. Battery Connection: Connect the positive and negative terminal of the battery with the corresponding terminals on the generator. Once done, place the unit and tighten it using a clamp. Fumes: The exhaust system of the generator should be facing outside the RV and not inside. The last thing you want is to find your RV full of smoke. It’s not just any smoke but carbon monoxide that can be life threatening. This is also why you should not stay close to the generator while it is operational. These are some of the most desirable and premium camping and RV generators on the market. At the end of the day, pick one that suits your needs and has the features that you are looking for. Briggs and Stratton is known to produce viable portable generators that pack great features and quality. The 30651 P2200 Powersmart inverter generator is one of them. This beauty is a perfect combination of efficiency, portability, and reliability. It’s a quiet generator that is suitable for both home and outdoor use. You will get excellent power, runtime, and quality when you have the P2200 Powersmart to run your appliances. Power: This generator offers 1700 running watts. However, thanks to starting watts of 2200W, it is able to support some bigger appliances as well but they should only require a maximum of 1700 consistent watts. It is not the most powerful generator out there, but it’s enough to run small appliances like blenders, lights, etc. It’s made to carry along when you go on trips so that you have no trouble during your trip. LED System: The unit has an LED system that makes maintenance easier. It has 3 LED lights, each telling a different generator status. The first light displays the current status of the generator. Thanks to this system, you do not have to worry about manually check oil or voltage. The light can help you make decisions and allow you to keep the system well-maintained. Noise: One of the biggest advantages of this generator is its ability to work quietly. It produces a noise of 59 dB only when kept at a distance of 23 feet. However, the noise increases when the load exceeds 25%. This portable generator will provide you a good night's sleep by allowing you to run an electric fan and a bulb for 8 continuous hours. You will not have to worry about getting up in the middle of the night to add fuel, etc. Parallel Connection: It is one of the few smaller generators to offer parallel connection capability. This feature lets you connect two similar generators to double power and also increase the number of outlets. This is a great option if you have more appliances to run or run for longer hours. Connecting the two generators is easy and requires no expertise. Starting System: It might not have an electric start mechanism but the recoil system isn’t much difficult to use as well. The cord is smooth and doesn’t require a lot of strength to kick start the unit. This is especially because the unit is small, so you do not need a lot of strength to pull the cord. However, if it’s on the ground then you may have to bend a little to do the job. Outlets: The generator has two 120v electric outlets to run home appliances and one 12v DC plug to charge sensitive devices such as mobiles, tablets, etc. There’s a separate port to make a parallel connection and increase the wattage power from 2200W to 4400W. Easy Carry Handle: The unit has an H-handle design that makes it easier to carry it from place to place. Plus, with a weight of 54.6 pounds only, it’s a breeze to carry. Warranty: The company offers 2-year consumer warranty and 1-year commercial warranty. Efficiency: The engine inside the generator is computer controlled and can adjust to various speeds depending on the load. This helps keep the noise low and safe energy. It will not be entirely wrong to state that the engine is smart and also economical. Safe For Sensitive Appliances: No matter how powerful a generator is, things can go south if it is not meant to support sensitive appliances such as phones, computers, tablets, etc. Briggs & Stratton P2200 features less than 3% harmonic distortion. Hence, you can charge all kinds of appliances without any trouble or risk. Drain Off Tray: Oil replacement is very easy thanks to the presence of a tray that helps prevent oil from spilling on to the ground. Super Lo-Tone Muffler: The muffler plays a vital role in reducing the noise. ​The drain tray makes it easy to change the oil. ​Safe for sensitive gadgets (less than 3% harmonic distortion). ​Not suitable for long trips or to power bigger appliances. Q. Can I use the P3000 model or P2200 model in parallel connection? Ans. Yes, you can. You will, however, need to buy a parallel kit separately to do so. Q. How to prevent the unit from getting stolen as it’s so light? Ans. You can buy a bike lock and connect the unit to a pole for safety. Q. Does it provide clean electricity? Ans. As seen in the name, the generator uses inverter technology which makes it safe for all kinds of appliances. ​Briggs & Stratton P2200 Portable generator might not be the most powerful generator on the market but it is portable and safe to use. WEN started in 1951 and today enjoys a good reputation. It specializes in manufacturing everyday tools such as chainsaws, knife sharpeners, and soldering guns. However, it has also made quite a name when it comes to high-quality generators. In this WEN 56180 generator review, we’ll have a look at this beauty. It is a portable generator capable of delivering lots of power for many hours. This gas-powered generator has a larger fuel tank and a durable engine as well. It offers 1800W of starting power and 1500W of running power which can help you start many appliances. It may not be the biggest or most powerful generator out there but it can be suitable for users looking for a small generator. ​7.5 hours on 50% load. 1. Solid Engine: WEN 56180 comes equipped with a powerful 98cc 4-stroke OHV engine. This top-notch engine can deliver continuous power without heating up thanks to the internal air cooling system installed. The air cooling system keeps the internal components cool including the engine. Hence, there is no risk of the engine sustaining any damage even if the weather is hot. 2. Power: With this generator, you get clean and continuous 1800 watts of starting power and 1500 watts of running power. This much power enough is enough to run appliances such as blenders, slow cookers, computers, television sets, and fans. We suggest that you always look at the label on the appliance to make sure that the generator can support it. It’s not exactly made to run ACs or irons as they require a lot of power but it is enough to offer you a good night’s sleep during summer or allow you to work outside when it’s dark as it can support a bunch of fans and light bulbs. 3. Runtime And Gas Tank: WEN 56180 incorporates a 1.1-gallon fuel tank. It sounds a tad bit smaller but surprisingly, this tank can last up to 7.5 hours when the unit is operated on 50% load. The longer runtime feature makes it trip and picnic ready as well. You can easily relax and count on the generator to keep you comfortable and your appliances running for a long time. Two AC 120V 12.5A three-prong wall outlets which are typical household 5-20R. A cigarette-lighter-style 12V DC outlet on the unit. You can utilize both the outlets together and run two appliances simultaneously. However, keep tabs on the overall power and make sure that it doesn’t exceed the generator’s limit. 5. Starting Mechanism: There’s no electric push-button start system on this compact generator. It might be a shortcoming but the pull start system on the unit is not too bad. The cord is flexible and it doesn’t require a lot of power to pull. However, we do wish it had the electric system. 6. Portability: This generator is easy to store and carry around since it weighs only 50 pounds. Apart from being one of the lightest generators, it also has side handles for better grip. Do not worry about having to put a lot of strain on your hand thanks to these features. 7. Silent Operation: This unit has a decibel noise rating of just 65 dB when operated at 100% load. You can choose to keep the generator at a distance to make sure the noise does not bother you. If that doesn’t work, consider reducing the load as it may considerably reduce the noise as well. This is possible thanks to the engine being secured on motor mounts which suppresses noises by reducing vibrations. 8. Spark Arrestor: Generators do come with certain risks. They may malfunction or cause the attached appliances to sustain damage if the load exceeds the generator’s capabilities. This, however, is not a concern with WEN 56180 as it has a spark arrestor installed. The attestor limits power supply and ensures that your family and appliances remain safe. 9. Low Oil Shutdown: Running the generator at low oil is risky. It can cause damage to the engine and also affect connected appliances. The solution to this problem is present in WEN 56180 in the form of low oil shutdown. This feature gauges the oil levels and notifies the user and shuts down the unit when it detects low oil. This is important to ensure the unit continues to work well and for a long period of time. All you have to do is refill oil and you’ll be once again ready to use the generator. ​EPA III and CARB compliant. ​There’s an oil funnel to refill oil, hence no spilling over the ground. ​Lightweight at just 50 pounds. Q. Can I power up a heavier appliance with it? Ans. This generator is meant to power small to medium appliances. We suggest you to never put more pressure than what it can handle (1500W). However, some items may need more starting power and less continuous power, hence it may be able to handle some bigger appliances too due to it offering 1800 starting power. Q. How to refill the oil and which oil to use? Ans. It requires less than a quarter of oil. You can use synthetic oil. Follow the guide for instructions on how to refill oil. Q. Is it difficult to move around since there are no wheels attached? Ans. Not really, because the unit weighs only 50 pounds. You can easily carry it. This is also why it is suitable for outdoor uses. If you are looking for a smaller portable generator that can power up small to medium appliances then WEN 56180 can be a good choice. It is durable, reliable, and with some kickass features. Duramax is a name of quality, durability, and reliability. The company is popular for manufacturing top notch generators to serve in times of power outages and outdoor trips. Almost all the generators made by the company are one of a kind but there’s one that packs a strong punch, DuroStar DS4000S. It is a powerful and long-running generator that can cater to your electrical needs with great ease. DuroStar DS4000S is can be used for home, work or outdoor purposes thanks to its portability, superior wattage, fuel efficiency, and multiple outlets. Power Output: DuroStar DS4000S offers 4000 watts of surging power and 3300 watts of continuous power which is commendable for its size. It might not be a big generator but the power output it provides beats many of its rivals. It’s enough to power up many small to medium appliances including refrigerators, sump pump, television sets, microwaves, and small ACs. The rule of thumb is to figure out the total watts you need and to ensure it remains under 3300 watts. Runtime: This gas-powered generator has a 4-gallon fuel tank. When full, it will continue to provide juice to the connected appliances for up to 8 hours at 50% load. This takes care of your outdoor trips and longer power outages at homes as well. Hence, it’s a viable unit for both purposes. Plus, 8 hours of uptime is enough to ensure you can have a peaceful sleep. Moreover, you may even opt to reduce the load to enjoy more uptime. Fuel Gauge: When you’re on a camping expedition and want to use the generator for many hours then it’s necessary to keep a tab on fuel consumption. Timely refills will prevent sudden tripping. Thankfully, DuroStar DS4000S comes with a fuel reading gauge that allows you to check the remaining fuel in the tank. This makes it easier to know when to fill the time so that you do not have to live a moment without power. Powerful Engine: The unit incorporates a solid 208cc 4 stroke OHV engine that keeps on pumping consistent wattage power. Another interesting feature of the engine is its ability to keep the entire unit cool with its air-cool technology. It will minimize heat accumulation and make sure that the generator doesn’t overheat. Starting Mechanism: DuroStar DS4000S works with the simple cord pulling mechanism. All you need to do is pull the cord 2 to 3 times with force to turn the generator on. While it is not as good or comfortable as the electric button some generators have, it’s still not the most difficult mechanism since the generator typically starts in a single pull. However, it may change if you do not provide the unit with the type of care it needs. Low Oil Indicator: It’s essential to keep an eye on the oil present in the tank to ensure you never get out of it. Operating the unit when it’s low on oil can cause the unit to malfunction. It may even be bad for connected appliances as low oil can result in voltage fluctuations as well. This is a major concern but with DuroStar DS4000S, you won’t have to worry about such problems thanks to its low oil shutoff feature. The unit will shut down automatically when the oil gets low. It may sound like a hindrance to some but it is important for your safety. You can always refill the oil and turn it back on. Filling the oil is not a problem here. Just follow the guidelines given in the manual. Noise: This generator is not super quiet and produces noise at 71 decibels. However, thanks to the muffler attached, it is reduced to 69 decibels at 50% loud. While it is not too loud, it may be too much for some users. Hence, we suggest to use a cord and keep the generator at a good distance to minimize inconvenience. Super Durable: The generator comes enclosed in a durable steel frame and the engine comes equipped on motor mounts. This makes the generator super sturdy and also helps reduce vibrations. Voltmeter: Helps gauge volt to ensure you never go overboard. Circuit Breaker: Cuts off power to protect appliances in case of fluctuations due to overload. Oe 120-volt 30-amp twist-lock outlet. The benefit of the 30-amp twisting lock outlet is that you can connect the generator directly to an RV and power up a few appliances that fall under 3300 watts. It’s RV ready, hence suitable for outdoor uses. Weight: DS4000S only weighs 94 pounds and also has side handles for two people to easily carry it. To make things easier. In addition to this, you can also install wheels for easy handling. Warranty: The unit comes with a 1-year warranty. ​Supports both camping and RV. ​A bit heavy at 94 pounds. ​Q. What is the role of a muffler in a generator? Ans. It helps suppress the noise by reducing vibration and sucking the noise. ​Q. Can it be used for camping and RV? Ans. It is an RV ready generator, hence it can be used for RVs. Plus, it can handle extreme weather conditions thanks to the presence of a sturdy frame, hence using it outdoors should not be a problem either. ​Q. Is the company reliable? Ans. DuroStar is one of the most respectable names when it comes to generators. It offers excellent customer support and is known for its great products as well. Hence, it’s quite reliable. If you are in search of a portable generator then DuroStar DS4000S can be an excellent choice. It is quite powerful and easy to use. Plus, the warranty can also offer you peace of mind. Westinghouse is one of the oldest names in the industry and dates back to 1886. From energy solutions to smart appliances, this company does it all. However, Westinghouse is best known for the durable and efficient generators they make. In this review, we’re going to have a look at Westinghouse Wgen 7500, one of the company’s top products. Westinghouse WGen7500 is a user-friendly portable generator that packs top-notch power to run a diversity of appliances. It is portable and can be taken to trips and camping expedition. It offers 7500W of power with which you can easily run a wide range of appliances such as refrigerators, television sets, and sensitive appliances like laptops, phones as well. Power: One of the strongest suites of this generator is the power it delivers. With peak power of 9500W and running power of 7500W, this unit is a force to be reckoned with. With Wgen 7500, you can easily run kitchen appliances, heaters, microwaves, electric fans, bulbs, refrigerators, window AC units, and many other appliances as well. Thanks to such a huge variety of appliances supported by the generator, it is perfect for outdoor use as well. Runtime: There’s a 6.6-gallon fuel tank on this generator that will last for about 16 hours easily. It offers excellent run time, hence can be a good choice if you want to go on longer trips as it will be by your side for a long time. Powerful Engine: It incorporates a solid 420cc 4 stroke OHV engine which comes enclosed in a cast iron sleeve for extra protection. The engine is reliable and does not require heavy maintenance. Overload Indicator: Wgen 7500 has an overload indicator that will alarm you when the current load exceeds the maximum load. This is a great feature that protects not just the generator but appliances as well. Putting a lot of load on the generator can cause appliances to malfunction and the engine to fail as well. Plus, it also increases the risk of fires. Overload indicator helps reduce the risk as it allows you to keep an eye on the load. Outlets: It contains two 120v AC duplex receptacle GFCI outlets and one 120/240v twist lock receptacle. The cherry on top is that all of these outlets are enclosed in a rubber casing to enhance safety. This is one of the major reasons why the generator can be kept outdoors without any trouble. Efficiency Mode: This mode reduces the load and helps you save fuel. As a result, you get extended run-time while also getting to save money. User-Friendly Start: Starting the unit is super easy as all you need to do is push the electric start button. There is no need to worry about having to pull the cord. Plus, there is also the remote start option for more ease. Apart from that, it has some amazing user-friendly features such as an LCD to show how the unit is performing and a fuel meter gauge that tells you when to add fuel. These features make it easy to maintain the unit. Noise: It comes with a muffler that reduces the noise, as a result you will only have to bear 64 dB of noise. Remote Control Start: You can start the generator from a distance too thanks to the remote key fob operation. No need to worry about having to walk the distance thanks to this amazing feature. Safety: The generator has two circuit breakers and a low oil shutdown option. The unit will shut down automatically if the oil gets too low. This is a great feature as it ensures the generator remains safe. Accessories: Wgen 7500 comes with an oil funnel, oil, manual and a quick start guide. We suggest that you read the guide as it is informative and well-written. Warranty: You will receive a 3-year warranty when you buy the Wgen 7500. In addition to that, the company offers lifetime technical assistance as well. ​Gas powered and transfer switch ready. ​3-year warranty with lifetime technical support. ​Air cooled cooling system prevents overheating. ​Outlets are secured with a rubber casing which keeps moisture and debris away. ​CSA, EPA, and CARB approved. ​The durable steel frame is great. ​Very heavy at 192 pounds. Q. Is this a transfer switch ready generator? Ans. Yes, it is. You can distribute the load using this feature. Q. What is the range of the remote? Ans. It covers a distance of 109 yards. Q. How’s the customer service? Ans. The customer service is very good. You will have no issues in getting in touch with the company if you need to avail warranty or technical support. You can call the company or write an email. However, the best option is to get in touch with the nearby service center. ​Westinghouse Wgen7500 can be a good pick if you need a power generator that’s also easy to use. This one is not too noisy but works very well. The DuroMax XP4400 is a midrange portable generator with a peak power output of 4400 watts. It is enough to power some high-end appliances like refrigerators and LCDs. It’s highly portable and can be a reliable backup generator for emergencies as well. Maximum Power: The maximum output of DuroMax XP4400 at startup is 4,400 watt which later stabilizes at 3500 Watts. This high output allows you to attach high voltage appliances to this generator. You can even use it at worksites to run different tools. Engine: Duromax XP4400E has a 7HP 4 stroke forced air cooled OHV one cylinder engine. It is very safe to use with no risk of the engine heating up as cooling is taken care of. This is an important feature as it protects the engine and enhances its lifespan. Dual Starting: Starting a generator with cable can often get frustrating as it often takes multiple pulls to get the job done. You will, however, face no such difficulties with this beauty as it comes with not just the manual recoil system but electric start as well. You will have no trouble in starting the engine. This can extremely be useful if you’re old or have back troubles. The recoil system can be a good back up to count on in case the batteries need replacement and the electric system doesn’t work. Operating Time: The generator can go for about 8 hours at 50% load on a full tank. You can increase the run-time by reducing the load. Similarly, operational time will reduce when you increase the load. However, the run-time of 8 hours is pretty good. You can sleep peacefully and the generator will continue to do its job. Control Buttons and Meters: The generator comes with a voltmeter which helps you keep track of your voltage output. Other than this, there are various control buttons for easy handling. Noise Suppressing Muffler: It has a super quiet muffler which allows the generator to run at a noise level of 69dB at rated load. Even though it’s a little noisy compared to other generators, it’s still not too loud. It equals to two people laughing continuously, however it may not be as soothing as laughter can be. Overload Protection: Thanks to dual 15 amps circuit breakers, there is no risk of worry. The circuit breakers will automatically cut off supply if the loud goes above the generator’s capacity. This is important to keep the generator and your appliances safe and secure. Weight: It weighs 120 pounds but do not let the weight intimidate you. It has wheels for easy handling. These all-terrain wheels make it highly portable as well since you have no difficulty in moving it around. Durable And Strong: The metal composition and the open steel frame enclosure give this generator sturdy and durable shelling which can help safeguard the generator from damage. Low Oil Shutdown: Automatic low oil shutdown feature protects the generator. It shuts off automatically when the oil is low as running a generator in such a condition can be risky. Outlets: It has two 120 volts AC outlets, one 120/240 volts outlet, and one 12 volts DC outlet. These variety of power options allow the generator to be used in every possible way. For example, the 12-volt outlet can particularly be useful in jumpstarting car batteries. The 120/240 volts outlet can be used for power tools. Switching Output: The 120/240 volts outlets has a voltage selector switch which automatically switches from 120 volts to 240 volts when the voltage increases. Warranty: DuroMax XP4400E comes with a 1-year Limited warranty. The company is known to be customer friendly, hence you will have no difficulty in availing the warranty. Environmental Friendly: It’s EPA and CARB compliant, hence safe for the environment. Feel assured and guilt-free that you’re not contributing to global warming. ​Comes with spark arrestors, making it perfect for outdoor use. ​Has 3 different levels of voltage output:12, 120 and 240 volts. ​Comes with high-quality all-terrain puncture proof tires. ​Safe to use thanks to features like circuit breakers and low oil shutdown. ​Can be a bit noisy at times. Ques: What important things should I know before I operate this generator? Ans. Don’t change the voltage selector switch with the AC circuit breakers ON. This may damage the selector switch. Ques: Is it easy to maintain? ​Check oil before starting up the engine. Replace oil after every 20 hours of use. Clean the air filter after 50 hours of use or once in three months. Clean the fuel filter after every 100 hours of use. Make sure to clean spark plugs after 100 hours of use. DuroMax XP4400 can be a good pick if you need a power generator. It may not offer parallel capability but it’s enough to run some big appliances. Plus, it’s easy to use and highly portable. Solar panels are not the only way to go solar. You can also choose to invest in solar generators. They are compact and serve as a reliable source of power backup in times of need. They use solar panels to capture the sun’s energy and convert it into electrical energy to charge or power up appliances. They are easy to travel with and quite convenient as well. This is why they are not only suitable for indoors but outdoors as well. There are a plethora of solar generators on the market and deciding on one can be a daunting task. To make it easier, we have picked some of the best solar generators on the market on the basis of quality, features, and power. You can go through them and pick one that best suits your needs. If you are in search of a solar generator that is capable of delivering lots of power then Peppermint Energy Forty2 Pro can be a good pick. It is a top-notch device that is built with quality materials and will easily keep heavier appliances running during power outages. ​Fast charging (only 3 hours). ​Offers both USB outlets and wall outlet plugins. ​Briefcase design makes it portable and easy to use. This unit only takes 3 hours to charge fully. This is an amazing feature and makes this generator more desirable. Extreme power is another plus point of this unit. You get 2000 watt hours from this generator. This is enough power to run big appliances like refrigerators, TVs, etc. What good is a solar generator if it’s not fit for portability? Fortunately, this one is super light and most importantly, it has a briefcase design that makes it super compact. It is also quite easy to use – open the latch on the briefcase and keep it under the sun for the panels to produce electricity. Versatility is another strong point of this generator which makes it a lot better than rival solar generators. Since it contains several USB charging outlets and wall outlet plugins, you can use it to charge a plethora of appliances. ​Charges fully in just 3 hours. ​Runs for 144 hours on full battery (on 10 watts). ​Safe to use during charging. ​No instructional manual makes it a bit difficult to use. This is a powerful solar generator that is quite easy to travel with thanks to its briefcase design. Goal Zero Yeti 1250 is one of the best solar generators on the market because of the sheer power it brings to the table. It can cover most of your charging needs without any hassle. ​LCD screen displays power, input, and output. ​Charges from a wall outlet in 18 hours or from two boulder 30 solar panels in 40 hours. ​Contains all kinds of ports (AC/DC and USB). ​Comes with a wheeled cart. Goal Zero 1250 can power 10 different gadgets at the same time. It produces 1200W of continuous power. You can further increase the power by connecting the unit to a 100 mAh lead acid battery. The device is easy to charge back up. All you’ll need is an AC plug or solar panel to do so. It comes with all the required accessories including a Boulder 100 Briefcase solar panel, cord, and kickstand. The cord is quite long, hence you will face no difficulty in using it. The kickstand can also be used to properly position the unit. Apart from that, you also get a rolling cart and charger to roll the device and get access to supplemental power when required. Its monocrystalline design makes it very attractive and easy to move. Using the unit is a breeze thanks to the LCD that shows important information such as input, output, remaining charge, and generator status. This feature will aid you in keeping the generator well-maintained. You can charge the generator in two ways: a solar panel that needs to be bought separately or AC plug outlet. It takes around 18 hours to charge fully. ​The 1250 watt hour lead acid battery lets you charge 10 gadgets simultaneously. ​Can be connected to other batteries to extend runtime. ​Twin charging capabilities (AC plug or solar panel). ​The solar panel needs to be bought separately. This solar generator will take care of your charging needs like a pro. It charges fully in 18 hours and offers long runtime. Goal Zero Yeti 400 is the right fit if you need a portable solar generator that’s also affordable. ​It can power up to 7 devices simultaneously. ​Works on pure sine wave inverter technology to safeguard sensitive electronics. ​Comes with a 50-watt boulder 50 solar panel. ​Can be connected to a 33Ah lead acid battery for extended runtime. The unit is equipped with a BMS system that restricts you from overcharging and damaging it. Thanks to this feature, the flow of current will stop once the unit is fully charged. This is why the battery on this generator runs for years. You can easily charge up to 7 products with this unit as it offers 396wh when fully charged. It can charge a phone over 30 times and a laptop up to 5 times. This solar generator works on pure sine wave technology and makes sure to pass clean electricity. Hence, it is an ideal choice for sensitive electronics. It shows useful information such as charging status, watts used, input and output charge, etc. Keeping tabs on the information will help you keep the unit well-maintained and will let you know which appliance is using how much of power. It can be connected to a 50-watt boulder solar panel that’s quite durable as it is made up of monocrystalline materials. The advantage of using a solar panel for charging is that you won’t have to use any adapters or charging devices. Simply expose the panel out in the sun and plug the connector to the Yeti 400. Safety is another feature that you will find on this unit. It doesn’t give off any harmful emissions, but it’s still better to not sit very close to it. ​Can be charged through wall plugins or solar energy. ​Can be connected to other Goal Zero Yetis for longer run-times. ​Charges quickly using an outlet (5 hours). ​Solar panels take 16 hours to charge the unit. This is a good solar generator but may not be a good option for users looking for a lot of power. It is best used to run sensitive items. If safety is your top priority then we recommend Audew Generator Power Station. It is a blend of safety and quality which makes it the best fit for RVs, campings, and trips. ​Built-in BMS system to avoid overheating. ​Solar and portable battery generator. This powerful device is able to deliver 220 watt hours and 60,000 mAH to kickstart appliances. It can also be used as a supplemental power delivering source to light up appliances when the power goes out. It has one AC output that lets you power up to 250W, two USB outputs that support up to 60W, and two DC outputs. This way, you can charge 5 various appliances together. It takes 8 hours for the unit to charge completely because there’s no fast charge feature on this one. However, the good thing is that you don’t need to wait for it to fully charge in order to use it. Thanks to pure sine wave technology, it is safe to use and can run even sensitive appliances. Other than this, it comes equipped with a BMS (battery management system) for added safety. It allows the generator to automatically adjust power and prevent overheating. Therefore, this is one of the safest solar generators on the market. Plus, there’s no risk of corrosion. Apart from that, you can customize wall plug-in settings and change it as per your requirement to fit the prongs used in your country. This feature is for international customers who have different prongs. ​1 year warranty, 6 months replacement warranty, and 90 days refund policy. ​A bit noisier when powering AC devices. ​Cannot be used while being charged. Audew 220Wh/60000mAh Portable Battery Generator Power Station is one of the best solar generators on the market. You can charge it in two ways and use it to run a variety of appliances including TV sets and refrigerators. Suaoki solar generator will take care of your electrical needs when you’re traveling or facing power outage at home. It delivers clean electricity and offers 10 outlets to connect various appliances. You will find modern features on this unit such as 3.0 quick charging facility, maximum power point tracking technology, multi-device charging, battery indicator, and lots of LED status lights. ​Stores energy by connecting with a solar panel. ​Battery management system avoids overcharging. ​Triple input methods (USB, AC, DC). This 150wh solar generator is powerful enough to charge a number of appliances. It is super light at only 3 pounds and has compact dimensions of 7.3” x 4.3” x 4.7”. Thus, traveling with this beauty is a breeze. There are 4 DC outputs on this unit that let you power appliances such as vacuum cleaners, inflator pumps. It also has two 120v AC outlets to run a small fan, laptop, mini fridge, UAV, etc. Lastly, three 5v and one QC3.0 fast charging USB outlet let you charge electronics such as phones, laptops. It comes with a universal MC4 connector that allows you to convert energy and store it as well. However, you will need to buy a solar panel separately. Moreover, the unit has a built-in MPPT controller that has the capability of adapting to optimum voltage levels and auto-charge in the presence of sunlight. It takes about 8 hours to charge but may be more depending on the method used. ​Solar panel needs to be bought separately. This solar generator is commendable for the price it has. It’s extremely lightweight and easier to carry around. The best thing about it is that it contains 10 ports to power 10 different gadgets. How Do Solar Generators Work? Solar generators are slowly replacing conventional generators as they are efficient and also good for the environment. A solar generator works in a simple way. It traps the sun’s energy using solar panels and stores it in the battery for later use. They capture photos and have an inverter to convert this power into useable electricity. The bigger the solar panels, the more sunlight they’d be able to consume. Solar generators are the “IT” when it comes to getting back up power in times of power outages or when traveling. However, it is a tad difficult to pick one out of so many. If you are confused about a solar generator and which one you should pick then this buying guide will help you. There are some features that you must look into when buying a solar generator. Battery Storage: The metric used with solar generators is Wh-watt hours. The higher the watt-hours, the better. Different appliances need different watt-hours. For example, an iPhone requires 5.5 Wh while an electric blanket needs 200Wh. This means that you must buy a solar generator that has more than 200wh of power if you wish to charge and power up an electric blanket at the same time. With that being said, make sure to choose a solar generator that offers lots of watt-hours. It will help you charge multiple appliances and even kickstart a few heavier ones if they require low-wattage. ​Pure Sine Wave Technology: Solar generators must have this feature so they can run sensitive appliances without any trouble. It is important for generators to cause no voltage fluctuation to ensure the units or appliances face no trouble. Ways Of Charging: Some generators only offer solar charging which can be a bit slower if you are using a 50-watt boulder panel and a small watt-hour battery. Sometimes, it can take up to 18 hours for a small solar generator to charge using these components. To make sure that you don’t need to wait for such a long time, choose a solar generator that offers other means of charging as well. For example, there are generators that offer electrical charging using an AC outlet. They hardly take 5-8 hours to charge fully. Moreover, some generators can be charged via the car socket as well on 12V charge. Hence, go for a solar generator that offers at least two ways of charging. LCD Display: Running the generator blindly can have disastrous consequences. The LCD screen can show valuable information such as power used, output delivered, charge left, etc. This information is important to not only understand how the generator works but also to keep it well maintained. Number Of Outlets: Look for generators that offer at least 6-10 outlets. The more outlets they have, the more number of appliances you’d be able to charge. It’s even better if they have all three types of outlets: AC, DC, and USB outlets. However, having lots of outlets doesn’t mean that you can simultaneously charge appliances as per your will. You must calculate the amount of power required and the amount of power the generator can deliver. Portability: Most solar generators are light in weight, still it’s important to pay attention to the size and dimensions. ​Help The Economy: Solar generators do not run off of nonrenewable energy and are good for the environment. Plus, they do not cause smoke or pollution. ​Easier to Manage: There are no messy cables, hence they are very easy to use and operate. ​No Operating Cost: Since solar generators use solar energy to produce energy, there is no operating cost to use a generator. ​Perfect for Disasters: Natural disasters can leave everything ruined but they cannot prevent the sun from shining. Hence, a solar generator can be a good choice for such situations as it can be used to power different appliances. ​Savings in the Long Run: Solar generators may be expensive but they actually help you save money in the long-run as you do not have to spend on fuel, etc. ​Tax Benefits: Based on the size of the generator and the state you live in, you may be able to save money as they offer tax credits and other rebates. You may be able to enjoy up to 30% tax credit on eligible units. ​Quiet: Solar generators are usually quiet and result in no noise or disturbance. As a result, you can use them anywhere. Who Should Buy Solar Panels? Solar panels are for everyone who lives in an area that receives at least 6 hours of sunlight every day. This is because most generators require this much sunlight to work properly. Other than this, they are a good option if you want to save the environment while also getting to save money. How To Properly Set Up A Solar Generator? The rule of thumb is simple, some solar generators require little to no installation while some need to be set up professionally. When your goal is to power a lot of appliances and your solar generator packs some serious watt-hour capacity then you need to buy large solar panels and install them in an open space. It could be the roof, garden, etc. The next step involves connecting the panel or panels to the generator to make a connection and then installing a regulator. After that, you need to connect auxiliary batteries to wire the generator. Now, there are two ways of setting up a solar generator, on-grid and off-grid. On-grid installation is more common and easier than off-grid installation. All you need to do is position the solar panels on the roof and connect them to a grid inverter which further connects to an electrical network. It will then serve as a standby generator. All you need to do is connect the solar panel/panels to the solar generator and connect it to a 3-pin plug at home. The solar energy trapped by the solar panels will be utilized by the generator to charge appliances. However, make sure to use a controller charger to make sure that the unit doesn’t get overcharged. An off-grid setup is ideal when you want power while on the move. First, you will need to determine the amount of power required to power the appliances. Once you do that, you need to buy four deep cycle batteries along with 2-3 solar panels. However, if you wish to power up heavier appliances and support an entire house then you will need a huge budget. Solar Panels: You need durable and efficient solar panels to charge the batteries. If you are looking for efficiency then we recommend to go for monocrystalline solar panels. They are durable and last for a very long time because they are made with a sturdy aluminum frame. On the other hand, polycrystalline solar panels are less expensive but not as efficient as monocrystalline panels. Both these options may come with warranties so make sure to shop around. Next comes positioning which decides the amount of sunlight panels trap. The best position is south, at an angle of 30 degrees. However, the right position also largely depends on how your house is built. It is best to let experts decide where to install the unit. Battery: You will need a deep cycle battery to charge the generator using the solar panels. You can choose between lithium or lead acid batteries. Connect the battery to the solar panel for it to work. Voltage Regulator: A charge controller serves as a voltage regulator here. Its job is to prevent the batteries from overcharging. They are vital components that make sure that total voltage doesn’t exceed actual capacity. However, they do have a drawback. Charge controllers will cause a loss of power (20% to 60%). #1 Can I place the generator anywhere? Ans. The panels must be out in the sun so they can catch sunlight and produce electricity. #2 Will I have to wait for the generator to fully charge in order to use it? Ans. Depends on the model, some may require to be fully charged before they can be used but some can be used while charging. #3 Do solar generators only work when the sun is out? Ans. No, the batteries can collect power that can be used anytime you need it. #4 Do panels need cleaning? Ans. Yes, they do. Dust and pollen can get accumulated on solar panels and prevent sunlight from being collected properly. This is why it is important to clean the panels, especially if there’s no rain. These are some of the best and reliable solar generators on the market. Our favorite is SUAOKI Portable Power Station, 150Wh Camping Generator as it’s feature-rich but it does not come with panels. You can go for Peppermint Energy Forty2 Pro Max All-In-One Portable 2000Wh Solar Power Generator if you want a unit that comes with solar panels and is also save to charge all kinds of appliances. Other units on the list are also quite good, look around and pick one that suits you the best. Power outages are not regular in the US. Investor-owned utility customers have to live for about four hours without service, according to the numbers released in 2017. On the other hand, co-op customers have to live longer without electricity – for about six hours, averaging 112 minutes, every year. This number, however, does not take poor weather conditions into account, where you may be left without power for days. Storms and rains are common in most parts of the country and can lead to trouble. This is why it is important to install the best whole house generator so that your day-to-day activities do not get disturbed. Power outages affect our lives on a great level. Forget accessing television or the internet, even the food in your refrigerator may get spoiled. Here’s where you need to consider the best whole house generator. It will provide you with hours of electricity backup. All you need to do is find a reliable whole house generator. Each generator has its own characteristics which is why you need to choose one that fits your needs. A whole house generator is a powerful device that can transfer huge amounts of electric power to your home’s main power supply. It serves as a backup in times of need and allows you to light up your home. They can be activated manually or automatically, depending on the features offered by the unit. While they are useful, they’re usually very heavy but some may come with wheels. This gasoline generator pumps an impressive power of 4000 starting watts and 3500 running watts that allow you to power up heavy appliances including refrigerators, AC units. It has a recoil start system which is a breeze to start. It has a capacity of 2.9 gallons and will run about 17 hours on a full gasoline filled tank. You can also use the “Eco” mode to make the generator use less fuel and extend runtime. The unit comes with an LED system that will tell you about overload and also give low oil warning. Keeping an eye on these will help you prevent the unit from malfunctioning. If you think that 3500 watts of running power is a bit less to power up heavy appliances then you can also connect a 2800 watt or higher power inverter to it. This will increase its power and let you use more electricity. You can choose to run this generator on quiet mode and breathe a sigh of relief as it produces only 64 dBa of noise. The unit is not very heavy, but since there are no wheels underneath, it can become a nuisance to move it from one place to another. You can, however, buy a set of separate wheels and attach underneath for convenience. ​Offers parallel capability and is also RV ready. ​The LED system makes it easy to use the unit. ​Economy mode can help you save fuel. ​Can increase capacity by connecting an inverter. ​Wheels can be added separately. Consider Champion 4000-Watt RV Ready DH Series Open Frame Inverter with Quiet Technology if you need a low sound producing generator. It is suitable for homes, work, and play. Briggs & Stratton 30664 8000W Generator can be a perfect fit for users looking at powering big appliances such as ACs and heaters. This 8000 watt whole house generator features an electric start which makes it super easy to start. There’s also a recoil system as a backup. This unit doesn’t provide as much runtime as the Champion 4000 due to a smaller tank of 7.5 gallon capacity. Nonetheless, you will get 9 hours of runtime at 50% loud. The unit has the tendency to shut itself off in case of low oil. This will prevent the generator from malfunctioning. Moving the unit is a breeze thanks to the installed wheels underneath. They make it easier to carry around this extremely heavy generator from place to place. ​Incorporates a quality OHV engine. ​Fuel gauge and hour meter to measure gas level. ​Produces 25% more surge power to handle heavy appliances. ​Wheels make it easier to move the unit. ​Very heavy at 251 pounds. This can be a good option for users who want a powerful unit. However, it cannot be shipped to California. Homeowners who are looking for a standby generator that has a lot of power and the option of using both propane and gas should turn to this one. It produces clean electricity and safe to run all kinds of appliances. It can produce 9000 of starting/surging watts and 7250 running watts. Hence, you will not have a problem in running even the heaviest of appliances like refrigerators, ACs. The generator offers both the recoil and electric start options. You can start it by simply pushing a button or use the recoil system as a backup. It has a fuel tank of 6.6 gallons which is enough to run it continuously for 9.6 hours. Moreover, it supports both 120v/240v outlets and allows you to connect 10 different outlets simultaneously. While the unit is powerful, it can create a lot of noise (75 dBa). Therefore, you need to find the right place to place it so that the noise does not disturb you. Also, it may be a bit heavy at 215 pounds but the good thing is that it comes with attached wheels. Hence, you will not have problems in moving it. ​Solid 420v OHV engine with a cast iron sleeve. ​Shuts off automatically in case of low oil. ​100 lb LP tank not included. ​Can be a bit noisy. Powerhorse Dual Fuel Generator 9000 Surge Watts can be an excellent choice for homeowners who want power, clean electricity backup, and the option to run multiple appliances at the same time. This EPA/Carb compliant standby generator is a powerhouse and provides 12,000 starting watts and 9,000 running watts. There’s a 4 stroke engine in the unit which is capable of driving horsepower of 16. The unit can light up even the heaviest of appliances and works without any trouble. With a 7-gallon tank capacity, Ai SUA12000EC will run for 7 hours at 50% load. The runtime may not be a lot, but there are no voltage fluctuations and the electricity is clean. Starting it is a piece of cake as it incorporates both electric and recoil start systems. The electric start system is a must in heavy generators because it requires a lot of strength to pull the cord to start the unit. It offers 6 outlet connections to run appliances at the same time. There are 4, two duplex 120v (5-20 R) outlets, One, 120V (L5-30R), and a 120/240v L14-50R. Apart from that, you can use the 12v DC outlet as well. It features a low oil shutdown option and protects the unit from getting damaged. The unit is heavy but thanks to the wheel kit underneath, it can be moved easily. ​Equipped with a powerful 459cc engine. Ai Power SUA12000EC 12000-Watt Gas Powered Generator is a good choice for users looking to power big appliances. This whole house generator is affordable and easy to use. Kohler 20RESCL is hands down one of the best whole house generators. It can deliver 20,000 watts of electricity and backup your entire home during power outages. It packs enough power to back up two 5-ton AC units thanks to a 999cc engine while delivers 3600 RPM. This generator will turn on automatically after only 10 seconds of a power cut. You won’t need to find the unit in the dark and make efforts to start it. It features a reliable voltage regulation system (plus, minus 1%) that ensures all your appliances stay safe. It adjusts the output on its own and provides enough juice to the appliances. You have two fuel options, propane and gas to power up this generator. Moreover, the unit is super quiet with only 64 dBa and sounds similar to a common AC unit. You can keep it outdoors because its body is corrosion proof and is also tested under severe cold conditions (-30 degrees). It consumes 2.3 gallons per hour on 50% load and 3.9 gallons per hour on full load. The unit has the capability of shutting itself down in case of low oil. This protects the unit from malfunctioning. ​2000 hour or 5-year warranty. ​Automatic start makes it easy to use. ​Digital LCD display to read voltage. ​Connects between the main service panel and meter. ​Very heavy at 500 pounds. If you want an extremely powerful standby generator that can power up 2 heavy HVAC units and four additional non-essential loads then Kohler won’t disappoint. It is loved by consumers for the quality it brings to the table. ​They are kept in one place as they need to be connected to the main power supply (main meter). ​Most of them can regulate voltage and ensure that no appliances malfunction. ​Most can run even big appliances including ACs and refrigerators. ​They are ideal for long hours of load shedding and power outages as they offer long run times. ​They can be kept outdoors if they are too noisy. Should You Choose A Whole House Generator Or A Portable Generator? A lot of people confuse a portable generator for a whole house generator but the truth is that they’re different in many aspects. The main difference is of power and mobility. Portable generators need to be connected with power cords manually while a whole house generator stays in one place, connected to the main power and turns on automatically in most cases. Portable generators require a lot of maintenance while a whole house generator doesn’t. Whole house generators are more suitable to backup up a home because they provide a permanent solution and longer run times. If you face frequent power outages for long hours then a whole house generator is what you need. ​TV: up to 400 watts. Do the maths so that you can pick the best whole house generator. Whole house generators aren’t cheap which is why you need to look for ones that come with good safety features. Heavy duty whole house generators are enclosed in a corrosion-proof body. Hence, they can be stored outdoors. Apart from that, it is essential that the generator has meter gauges and low oil shutdown features, too so that you know about efficiency and other such factors. Moreover, a low shut down oil feature automatically shuts off the generator when the amount of oil in the tank goes low. A generator requires a good amount of oil to work properly. A lack of oil will restrict it from delivering the right amount of power, thus causing fluctuations. These fluctuations can cause sparks, appliance malfunctions and even damage the generator. Therefore, make sure that the generator has these capabilities. Whole house generators incorporate three types of starting systems: electric, recoil, and autostart. Autostart is the best option. It doesn’t require you to pull the cord, go near the generator or push any button. The unit is powered on automatically when the power goes off. The other method is the electric button start system. It requires an individual to push a button on the generator to make it work. This offers great ease as no physical work is needed. Lastly, the recoil system involves pulling a cord to turn the generator on. This is the most difficult method because it requires a lot of strength. In fact, you may have to pull the cord several times for the engine to start. Look for a unit that supports dual fuel, both propane and gas as it will be more convenient for you. Whole house generators can’t be super silent. They will produce a certain amount of noise because they are heavy duty devices. However, not every generator is meant to be super loud. Whole house generators that produce noise between 60-70 dBa are suitable. Anything above that can be unpleasant so pay special attention to this feature. Generators can overheat and malfunction, too. To avoid that from happening, make sure that they have a THD rating of no more than 5%. Liquid cooled or air cooled whole house generators can be a good option. Air-cooled generators are more suitable as they come with an internal fan to keep the unit cool. It does so by releasing heat and emission from the generator so that all the parts can work properly. Liquid-cooled generators follow the same principal. They use different lubricants to keep the unit cool. Q. Can you install it yourself? Ans. It’s common for people to take the DIY approach when it comes to installing things at home. However, such is not the case with whole house generators. It’s a risky process as you need to make a connection between the meter and the main power supply which is difficult for a common man. Hire a professional electrician or a plumber (for gas powered) for the job. It is also unsafe for a person to try installing a generator on their own because a wrong connection can produce a spark or worse, cause fire hazards. Q. Best Place To Store A Generator? Ans. The location is of huge importance as hard-to-access areas can make it difficult to maintain the generator and also reduce their life. Apart from that, ensure that water cannot reach anywhere near the unit. It should have a wide shelter to prevent rainwater from entering into the system. Moreover, it should be high enough from the ground so that water on the ground can’t damage it. Lastly, the place should be properly ventilated, close to a switch, and the ductwork should be done neatly as well. Q. Which Is The Most Suitable Fuel Type? Ans. Whole house generators should be carefully picked in terms of the fuel type they support. Old generators were confined to gasoline fuel only which resulted in poor stability and short life. However, modern whole house generators offer a dual fuel system, greater stability, and long lasting capability. Choose a unit that supports the type of fuel that is the most cost effective for you and also readily available. Q. What Are The Risks Associated With Whole House Generators? Ans. They may produce carbon monoxide gas, hence you should install them outdoors and not go near the unit when operational. Also, overloads may cause the engine to consume more fuel. Lastly, the engine may malfunction and cause sparks, damaging the unit or other appliances. In fact, poorly maintained generators may also cause fires hence make sure to pick a generator that’s reliable and durable. Q. Can They Run All Appliances? Ans. Most whole house generators are made to run all appliances, however this depends on the power of the engine. Also, running more appliances may reduce run time. Q. What Are The Right Amount Of Watts? Ans. The higher number of watts a generator offers, the more number of appliances you’d be able to power up. Some units may also allow you to connect inverters to increase power output. All the generators above are great. You should pick the best whole house generator keeping your requirements in mind. Kohler 20RESCL-200SELS Air-Cooled Standby Generator is the best option if you want a powerful generator. It is safe to use and comes with a long warranty but is quite expensive. However, consider Champion 4000 if you want an affordable unit that’s powerful and safe. The most important thing is to pick one according to your needs.